Safer, more efficient, more practical. Parallel transfer tapes or big 4 pin interface to strengthen the power supply and make the video card power independence from motherboard. 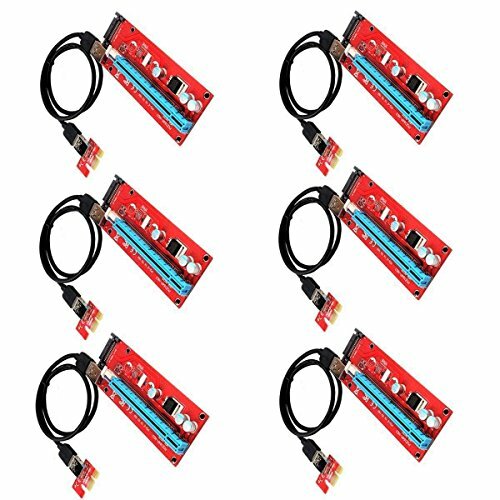 6-Pack PCI-E 16x to 1x Powered Riser Adapter Card USB 3.0 Extension Cable 4pin MOLEX to SATA Power Cable. Compatible with 1x,4x,8x,16x PCI-E slot of the motherboard,dedicated for bitcoin mining. SATA Power Direct Connection :Connection to your power supply reduces the power burden on your motherboard and ensures maximum compatibility with your power supply. Transfer card with SATA 15PIN interface to enhance power supply, so that the graphics card from the motherboard independent of the board, so as to reduce the burden on the motherboard to accept the graphics card. Gold plated contacts for better connectivity and long life,and with side clip to fasten other card. No driver needed,slot with a fixed buckle, easy to remove the graphics card and fixed graphics, so that the graphics card will not fall off from the slot. If you have any questions about this product by Sincerity, contact us by completing and submitting the form below. If you are looking for a specif part number, please include it with your message.